Quality Air Heating and Air Conditioning > Articles > Uncategorized > Why Install a Tankless Water Heater in Columbus, OH? Why Install a Tankless Water Heater in Columbus, OH? Storage tank water heaters are the most common type of water heater in America. More recently, there have been developments in more energy-efficient water heaters available for installation in your Columbus, OH home, such as tankless water heaters. If you are installing a new water heater in your home, we are here to help. 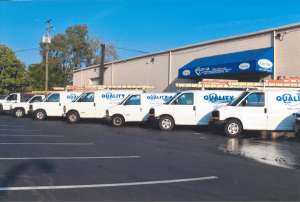 Call Quality Air Heating and Air Conditioning today! In tank heaters, water is kept continuously hot and ready for use. Depending on the size of your home, they range from 20 to 100 gallons capacity. Although tank heaters tend to heat water slowly, they also tend to lose that heat quickly when hot water is not being used. By contrast, the tankless water heater—also known as instantaneous or on-demand—can be installed in a central location or at various points-of-use. They work by sensing demands for hot water in your Columbus, OH home and begin to heat the water as it circulates through the copper piping. As the water circulates through the heat exchanger, it heats up to the desired temperature and travels to where it is needed. There are several advantages to this technology. They never run out of water. Tankless water heaters are incredibly efficient but they also heat water as it passes through the appliance, so there is no tank of hot water to empty. They last longer than tank systems. Tankless systems tend to last from 5 to 10 years longer than tank-based water heaters. Point-of-use flexibility. Their small size allows tankless water heaters to be combined with larger devices or placed closer to point-of-use. Higher efficiency. Because there’s no standby heat loss, tankless systems are more efficient than tank water heaters. That leads to substantial savings every month. Installing a tankless water heater in your Columbus, OH home is an important part of creating a safe and comfortable living environment. Call Quality Air Heating and Air Conditioning today for all your tankless water heater needs.